You are here: Home / The Best Website Builder For Your Website / GoDaddy Website Builder Review: Who’s The Daddy? GoDaddy Website Builder Review: Who’s The Daddy? GoDaddy offers perhaps the broadest array of web products for businesses, from domain names and hosting to an online storefront. And, of course, a website builder. The GoDaddy website builder is simple to use, and with the company's frequent promotional offers, is very affordable. But the platform is lacking in a few other areas, without a truly seamless way to add a store or blog into the website. While certainly not suited for every business type, the GoDaddy website builder does have a few perks. Unlike the handful of other web platforms we've tested out so far, GoDaddy doesn't offer a free trial. With payment required upfront, the sign-up process takes a bit longer, but not by much. Once you've added the desired package to your cart and check out, you can get started on building a website. Since GoDaddy offers several products, users aren't taken directly to the website editor after logging in, but to the dashboard. The dashboard offers access to all the products, including the website builder, but the additional step may make navigation a bit tougher for beginners. Once in the website builder, new users will be prompted to select their domain name and then a theme. 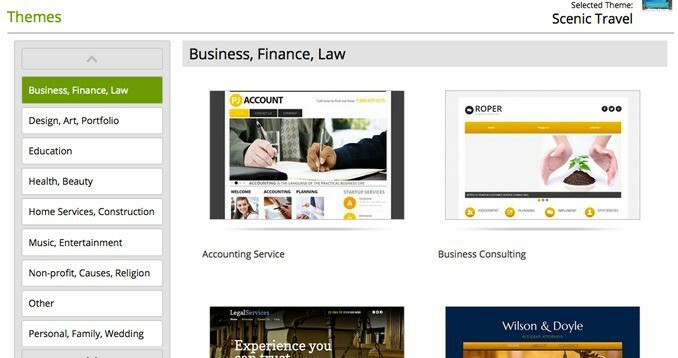 GoDaddy has the widest variety of theme categories we've seen so far, ranging from real estate to non-profit. Each category has several theme options and many of them could be adjusted to suit more than just one type of business. Themes are well designed and include a good amount of variety. The theme can be changed at any time, though users have to exit the website editor and access the themes tab in the website builder home page to do so. Once the theme is selected, new users are prompted to fill out the business name and address and then are taken to the website editor. A quick video outlines the features the first time you log in. Being one of the most popular domain registrars and hosting providers, GoDaddy is expected to have a few noteworthy features that will benefit anyone looking to make use of a good website builder. Since existing objects are edited simply by clicking on them, most changes are simple to make. New items are added through the toolbox at the left. One click will automatically add the item to the middle of the page, or users can drag and drop to where they'd like them on the page. Just like the existing elements that come with the template, items can be resized by dragging on one corner, or a specific width in pixels can be added under settings. The available options are quite good and even include an option to add blocks of HTML code. The navigation bar at the top allows users to navigate to different pages (or add new ones) or access the settings, like backup and restore and SEO options. Previews for both the desktop and mobile versions of the site are accessible here as well (the mobile site is only available with the business package). Newly added pages don't have templates to choose from—they're simply added blank except for the website header, navigation, and footer. All text, images and other items are added from the toolbox. At points, adding an element didn't increase the page length correctly, with part of the item overlapping the footer. When an element is deleted or moved, the page length also doesn't decrease. While most web builders adjust the length of the page automatically, GoDaddy users have to go into the settings and increase or decrease page height—it's a bit of a hassle, and may take new users some time to troubleshoot. While GoDaddy also offers an online store option, it can't be directly integrated into the website builder, at least not seamlessly, anyways. A link to the store can be added to the navigation bar, but that's it. There isn't a way to keep the design and settings exact between the blog and the store. Since the GoDaddy online store also allows users to add pages, that's the better package for businesses looking to sell online. The pages are a bit more limited in the store option, but will still work for most businesses. Business owners commonly add blogs to their website as a marketing tool, but like with adding a store, there isn't a good way to add a blog to the GoDaddy website builder. In the toolbox, users can drag and drop a blog feed, adding the RSS feed from any existing blog to get the posts to appear on the website. But, this only works for existing blogs—business owners would have to start a separate blog on WordPress, Tumblr or another platform instead of adding posts directly to the page. The blog feature also only shows previews—there is no option to display an entire post. When we linked to a blog that used both horizontal and vertical feature images, the layout overlapped and didn't look very nice at all. Since it's just a blog feed, users. The GoDaddy website builder is rather simple to use, not the simplest we've tried, but the platform will work well for most DIY pages. The drag and drop style editor is easy to use, though there are a few options like page length and choosing a new theme that isn't in the places we expected them to be. GoDaddy frequently offers special price promotions—at the time of our review, users could get the website builder for just $1 a month for the first year, including a domain name and an email. That's for the basic package, the business package is $9.99 a month and includes added features like the ability to add apps like Paypal and Yelp and a mobile version of the site. Still, it's an excellent price. Unfortunately, the GoDaddy website builder makes it hard to add a storefront or a blog. Both can be done, but require extra steps and don't blend into the design of the website. Because of that, it's hard to recommend GoDaddy for online stores or blogs. We even encountered a bug where the pop-up menu to adjust the settings on the navigation bar was cut off at the top of the page, so we couldn't see all the options. When issues do come up, the GoDaddy help center offers a range of tutorials and FAQs. Specific questions can be addressed through an online chat or phone; there isn't currently an email option. 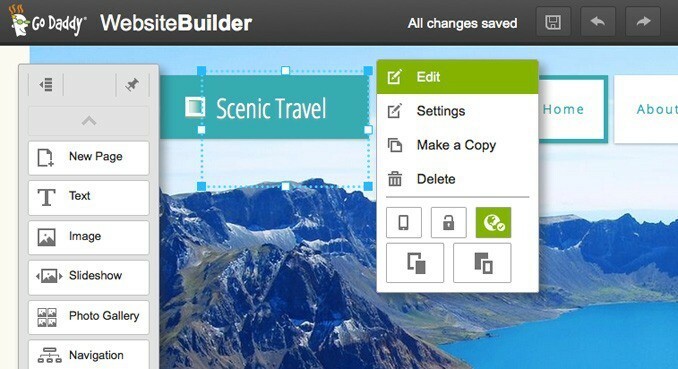 GoDaddy's website builder is an inexpensive, simple option for business owners. It's not ideal for storefronts or blogs, but offers a wide range of options for many other business types.